Simon Rochowski co-founder of studioplusthree, discusses platform house, the project that prompted him and fellow co-founders Julin Ang and Joseph Byrne to come together as a studio. 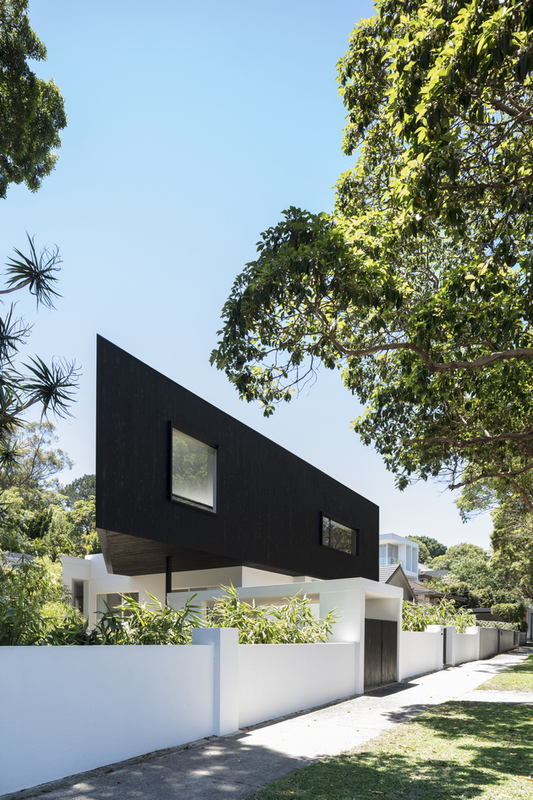 On a triangular block in Sydney’s east, a new living platform brings light, air and space to a highly constrained site. In an urban response to the site’s limitations of light and open space, living areas are elevated up to the tree canopy – offering lush panoramas, abundant light and a sense of horizon. Responding to a lack of open space, two distinct outdoor relationships were established – at ground level, the existing volume was pared back to create a cool, secluded garden related to the bedrooms; at first floor, living spaces open out to a bright, north- facing deck. This new living platform creates a datum – a continuous horizon line, along which openings are carefully located in response to trees, greenery and views. The depth of the south façade provides a dialogue with the street, with deep reveals allowing casual inhabitation of window seats along this elevation. Key to this experience is the western outlook: a lofty fig tree set against the city beyond. Providing seclusion from the street and protection from the western sun, a series of sliding perforated metal screens set against the tree canopy filter the light and views, with a vertical gradient of perforations offering privacy to neighbours below and transparency to the sky above. 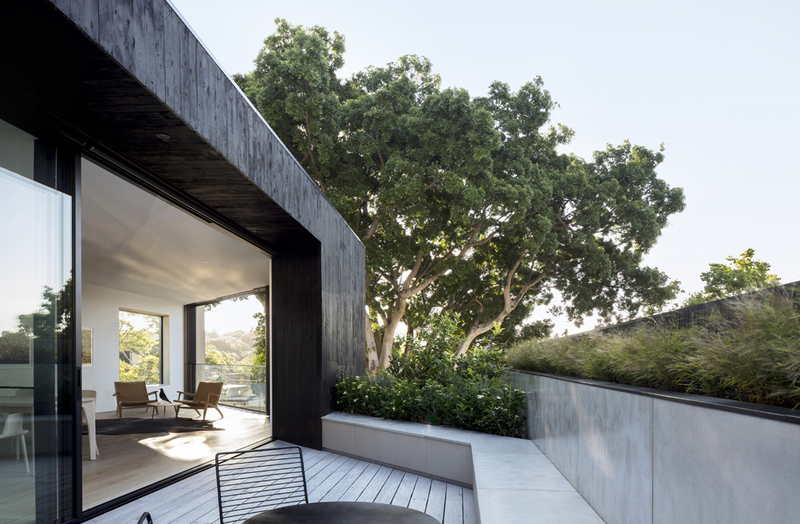 The cantilevered first floor volume provides shelter to the deck below and, at the first floor, opens the living spaces out to the north- facing terrace – offering open, social spaces and a continuous view to the treetops. Playing with contrast, materials define notions of inner and outer: dark charred timber cladding is cut away from the volume to reveal pale timber and clean white planes within. Responding to the triangular site, the diagonal cut is manifested in elements throughout – from window reveals to planter boxes and outdoor seating. The design aims to integrate functionality into the details to enrich family living, such as the northern edge of the elevated deck, expressed in a continuous element that incorporates planting, outdoor seating, privacy screen, benchtop and storage. 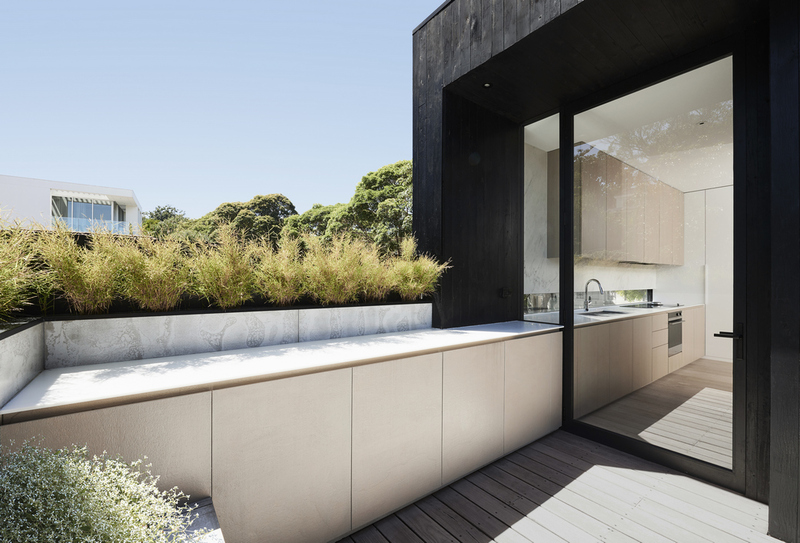 The blackened timber exterior belies a calm, bright interior that becomes a backdrop for dappled light, soft shadows and greenery playing through the elevated living spaces. With the building raised above its urban context, views over and through the canopy expand the perception of interior spaces, while the metallic bronze screen filters the movement of light, trees and the setting sun. How did the Platform house project come to you and how did it evolve? The clients had known us for a long time, and had been following our careers in architecture before commissioning us for their house. It was something of a leap of faith on their part, as we hadn’t even set up our studio at that point, but it was too good an opportunity to pass up from our perspective. The clients were still living overseas when the project started, but knew they were coming back to Australia, so there were lots of Skype calls and emails in place of face-to-face meetings initially. As it became clear that this was a serious proposition, we began to think seriously about our future intentions, and this was one of the projects that prompted us to come together as a studio. Tell us about the brief and what it involved. At its heart, the brief was always for a family home. A number of sites were considered before the final one was settled on. We actually advised them that the triangular site and existing dwelling would be challenging before they bought it – this was probably taken as throwing down the gauntlet! 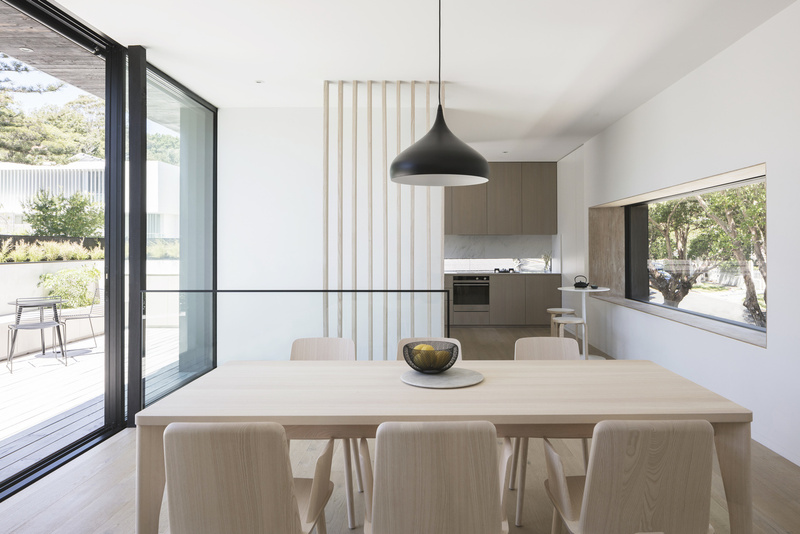 In addition to a family home, the brief was very much around it being a place for entertaining and socialising, and this informed much of our response to the layout of the house. The connection to the outdoors and sense of landscape was also important – a secluded and covered deck area at ground floor for the bedrooms, and living spaces that open out on to a north-facing garden terrace at first floor. The project really came out of a lot of influences from other areas of design and culture that both we and the client were exposed to at that time, such as Katsura Imperial Villa in Kyoto, which involves framing particular views of landscape through architecture. This also brought the feeling of simplicity, almost austerity, to the interior of the house, so that it serves as a backdrop or canvas for the light, greenery and views that surround it. Another inspiration was the social relationship between house and street that we had experienced in the Netherlands. This sense of openness and generosity was something that struck us as having a strong civic quality, which [urban writer] Jane Jacobs also talks about in the sense of building communities in the city, which is really important for us. One of the main influences was, of course, the triangular site. This guided not only the form of the house, but the program – having social living spaces upstairs, and more private bedrooms downstairs, which is an inversion of the typical domestic arrangement. This gives the first floor a beautiful sense of light, views and horizon throughout the day. How did you make your material choices? The interior we wanted to be very neutral and recessive, so that it caught the changing light and colours of the canopy around the house. 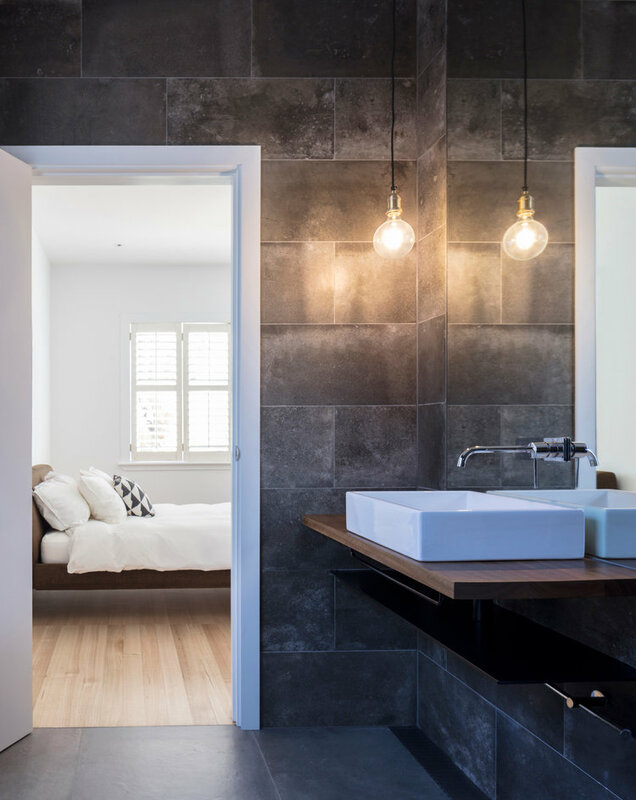 This was combined with natural materials like the timber window reveals and stair banisters – these elements help give the interior definition and warmth. 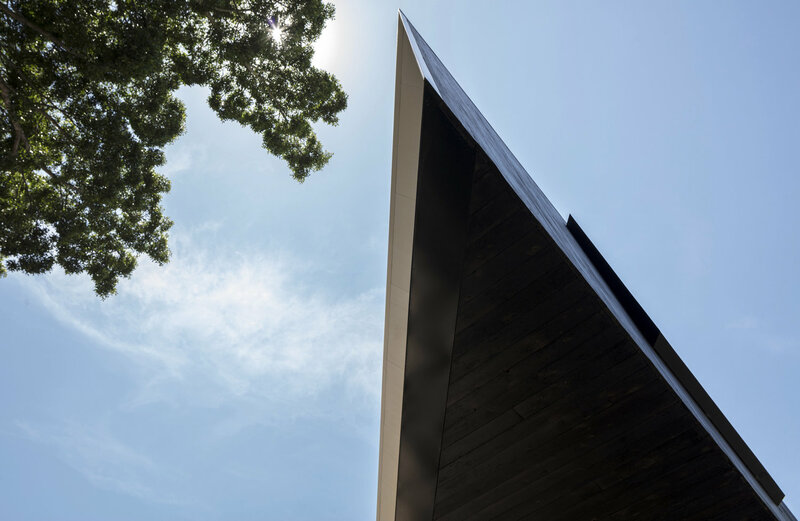 The exterior cladding, a charred cypress, was driven by the desire for a natural material that would subtly weather and patina over time, but that would be low-maintenance and durable. The shou sugi ban technique of charring timber is a traditional method that’s been used in Japanese architecture for centuries. How involved were the clients throughout the design process? Very! Both had a strong interest in design, and were always providing visual references and really getting into the details of how the house was designed and built. They really listened to our reasons for proposing the different elements of the design, sometimes going with it, sometimes challenging us to go further. It felt very much like collaboration, and the personality traits of both the clients and us can be seen throughout the house. Once into construction, they were even more involved, lending labour to some of the manual work that needed to be done, so they have a close connection and pride in the final outcome. Were there any specific requests or things you had to take into account during the design process? Once we got into designing the interiors, our client loved the blackened timber exterior and was interested to explore that dark palette internally as well. 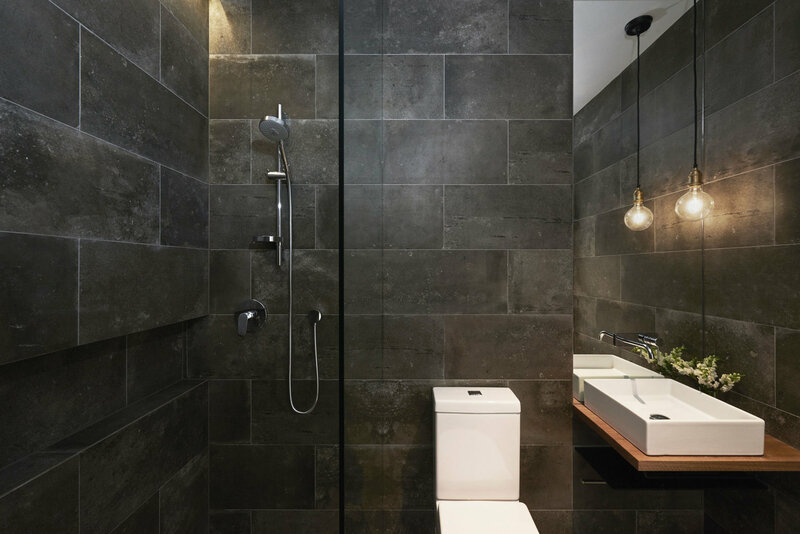 While they understood our perspective – establishing a neutral and pale interior colour palette for the main living spaces – they insisted that the powder room was the perfect opportunity to explore darker colours. So this petite powder room, with its black tiles, bronze ceiling and tall mirror, evolved into a moodily lit space with a touch of glamour. What were the biggest challenges and how were they resolved? The biggest challenge with this project was the tight triangular site – the project was developed largely in response to this condition. Rather than seeing it as a problem though, the house embraces this constraint, with the first floor volume following this geometry, which also finds its way into details throughout the house, such as window reveals and bench seating. The project was achieved on a tight budget, and we prioritised certain areas over others to retain the main ideas and gestures through the project. For instance, the ground floor was largely retained and rationalised to create the bedrooms, with emphasis placed on the first floor living spaces where the family would spend most of their time. The relationship with the outdoors was also problematic in its original form – the house was close to the boundaries on all sides, and had no space to ‘breathe’. We actually reduced the original footprint at ground floor by removing an unsympathetic later addition, creating space for a garden and deck connected to the bedrooms. What is your favourite element of Platform house? We’re pleased that the planning decisions we made early form the basis for the house, so that the main volume reads clearly in relationship to ISSUE 158 the surrounding tree canopy. This relationship between the architecture and the surroundings was always the key move for us, both with the landscape and also between the house and the street. This follows in the quality of light that’s experienced inside the house, particularly in the upstairs living space, and the corresponding effect this has on the social aspect. It’s a space that encourages people to naturally gravitate towards being together. This light-filled, north- facing terrace, with its built-in bench seating, is a particular favourite of ours. It stemmed from the idea of a private courtyard – a green oasis – that made efficient use of the available outdoor space. How do you feel about the completed project? We’re really happy that the project continues to bring a lot of pleasure to its inhabitants – our clients – and hope that these relationships to nature, family and community continue to be enjoyed by them. We were very grateful to have the opportunity to work on this project, and it’s great to see the realisation of our many ideas and conversations bring happiness to our clients. We’re also happy that the project continues to appeal to people beyond its owners; it seems to generate engagement in the local community, and we’re excited to share it with the public as part of its involvement with Sydney Open 2018. It’s perhaps not a conventional response, and so it’s wonderful to find an audience within Australia and overseas. For us, the project reflects an attitude that’s open and social, an example of how unusual or tight urban sites can still offer generous spaces for living – which we see as important for our future cities. This article originally appeared in AR158 – available online and digitally through Zinio.